For a chainsaw carver, having the appropriate tools can mean the difference between a winning sculpture and a larger pile of fire wood. 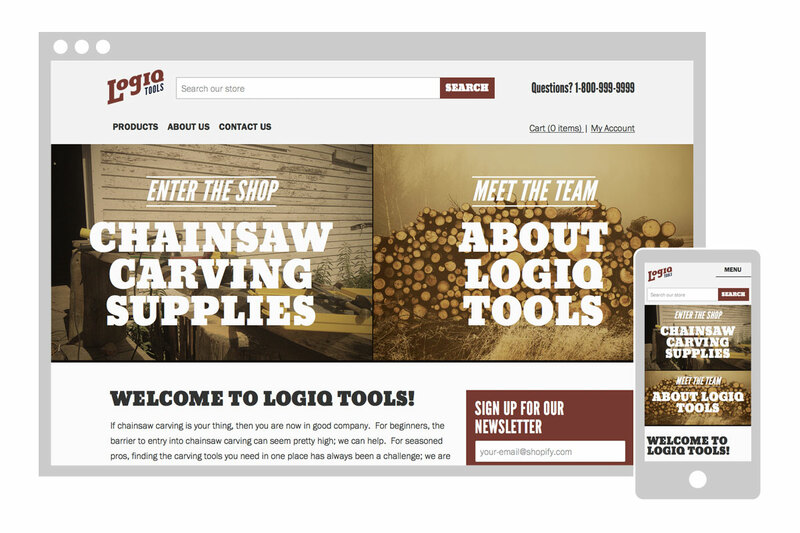 LogIQ Tools was started to easily supply tools and tips for chainsaw carvers. They contacted me to develop branding that would tell their story and connect to their customers. They also needed an e-commerce website that would be user-friendly and easy to manage. The branding that I designed helps to convey the company’s story and allows them to quickly connect to customers. Brand elements include logo, colors, type and imagery. A branding style guide helps to ensure that all customer touch points maintain that LogIQ Tools identity. For the website, I designed a layout that would both tell the LogIQ Tool story and make it easy for customers to browse and search for products. Rugged shop imagery and a clean layout show the vision for the company while presenting a site that is easy to navigate. This project has unfortunately been put on hold, but will hopefully be completed in the future.